I saw this sandwich on Diners, Drive-Ins, and Dives, and I wanted to make my own at home. 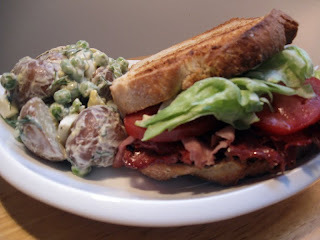 It's pretty much a BLT, but replace the bacon with some fried pastrami. It was definitely a fun way to change things up. I made the bread homemade, but you can just use store bought bread too. 1. Grab a handful of shaved pastrami. About 100 grams per sandwich maybe. And fry in a frying pan over medium heat. If you have any of metal dishes or container you could put it on top to keep the pastrami flat. 2. Slice some tomato, break off some chunks of lettuce, and slice up or grab two slices of your favourite bread. Put a little mayonnaise on each slice of the bread. Layer the pastrami on to the bread, then the tomato, maybe crack some pepper on the tomato, add lettuce, and then finish off the sandwich with the last piece of bread. 3. Eat with a side of potato salad! Cook some frozen peas and add to make the potato salad a little fun and different.